If you want to repaint your boat trailer, replace some of the bunks or perform some other repair or maintenance that would be impossible to do with the boat sitting on the trailer, you have two options. Take the boat to a marina, launch it and pay to keep it moored and stored while you travel home, do the work and return, or you can jack the boat up off the trailer, pull the trailer out from under and put it back when the work is finished. Position a jack under the keel of the boat as close to the stern as possible. Stack blocks of wood under the jack to elevate it high enough to enable the lifting mechanism to be able to contact the bottom of the boat. Position a block of wood atop the jack. This will protect the bottom of the boat and spread the pressure of the weight over a larger area. Lever the jack upward. At first the boat and trailer will both go up as the trailer springs decompress. Stop as soon as you first detect the boat moving up off the trailer. Leave that jack in place and position two more jacks as close to the stern as possible but two or more feet to either side of the first jack. Again, use blocks under each jack for height and atop each jack to protect the hull. Lever one of the new jacks up until you see it slightly lift the boat. Repeat with the third jack on the opposite side. The idea is to have the boat’s stern supported in three locations, with the jacks taking the place of the trailer's bunks. Lever each jack in turn one or two cycles to slowly and evenly lift the boat several inches off the bunks. Replace the jacks with jack stands. Move forward on the boat just astern of where the keel starts to slope upwards towards the bow. Again, position a jack under the keel and another pair 2 or more feet to either side, using blocks to adjust the height of the jacks and a protective block on the top. Lever the jacks evenly up against the keel first, then the two outer ones and raise the boat off the trailer. Once done, the boat should be completely free of the trailer. Move the trailer forward until one of the cross supports, axle or other part of the trailer threatens to hit the jack. Replace the jacks with jack stands, move the jacks behind the trailer cross member and using the same procedure, jack the boat up so the jack stands can be removed and the boat held up by the jacks. Move the trailer ahead once more, repeating installing the jack stands, additional jacking with the jacks, reinstalling jack stands, then inching the trailer ahead until the trailer is completely out from under the boat and the stands and jacks support it. 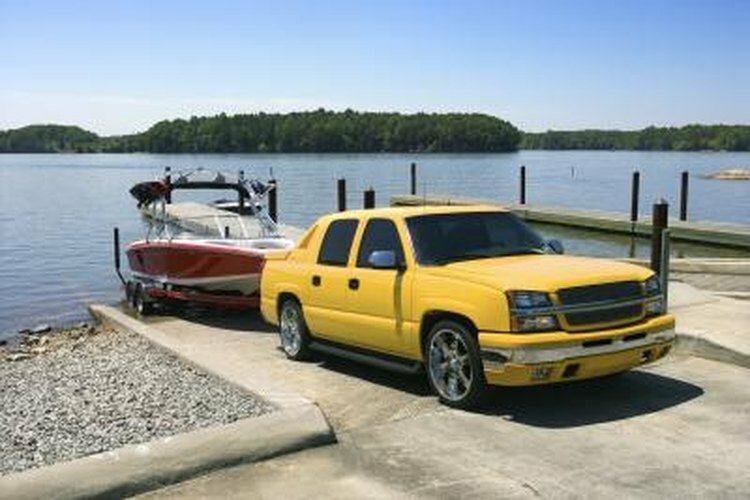 Once you complete the trailer repairs, reverse the process to reposition the trailer back under the boat. Be sure the jacks and jack stands are sitting on firm ground or pavement to prevent them from sinking in and perhaps upsetting the boat while being stored. Let the supports directly under the keel support most of the weight; the ones to the sides are there more for stability. Never climb inside the boat while it's being stored on temporary jacks and stands.